The best technique that I learned during my interview with Winston Hendrickson was how the Camera Profiles function works in Adobe Camera Raw. If you shoot Raw, you've got to check this out. It goes something like this. In Raw, you're capturing in a very large color space, larger than your monitor can display. So decisions have to be made as to how that color space is going to be represented when the file is processed. Adobe has its default interpretation, as does your camera manufacturer. With Camera Profiles, you can preview all of these options, and more, with just a click of the mouse. Then you can choose the color profile that best appeals to you for that particular shot. 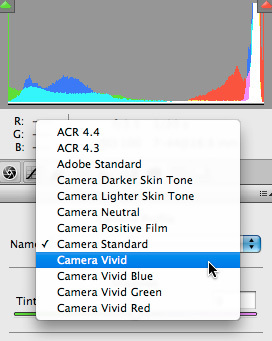 Just go to the Camera Calibration tab in ACR, and click on the Camera Profiles pop up. You'll be amazed at how different the various interpretations of the original color space look. And if you want, you can even create your own custom color profile. Great advice I discovered profiles sometime ago and don't know how I could do without them now.